This is Emerald Lake in Yoho Park, British Columbia, Canada. 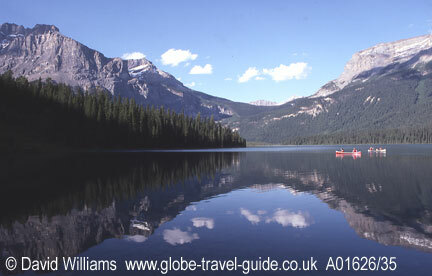 A peaceful lake, which is popular with visitors during the summer months, it is hemmed in by tall mountains which are part of the long chain of the Canadian Rockies. The lower slopes of the rugged hills are covered with Engelmann spruce. The website was launched in March 2003 as a resource for travellers by David Williams, a Scottish travel writer and photographer. The author has travelled through nearly 40 countries, mainly in Europe but also in North America and on the overland trail from Britain to India. In recent years he has written travel books about Scotland and Iceland. This website is linked to a travel bookshop, The Globe Travel Bookshop, which covers all the countries in the world, not just those which will be illustrated in this website. The bookshop includes books on travel, history, geography, natural history, politics, architecture, culture, the arts, literature, places to visit, walking, sport, food, drink... and lots more. Other companion travel websites are planned and will feature encyclopaedia-type articles from a number of countries. The first of these sites is The Scotland Guide. It has an associated bookshop, The Scotland Bookshop. Information on contacting the website, on copyright and on disclaimers are covered by the following links to the compansion website, The Scotland Guide.